"We have to get out of the house before mom and dad come home!" Momentum Pictures has released the trailer for Mom and Dad, a wild 'n crazy action movie from Brian Taylor, one half of "Neveldine/Taylor" (of Crank, Crank: High Voltage, Gamer, Ghost Rider: Spirit of Vengeance). The concept for this is nuts - something starts making parents go crazy and kill their kids. Yeah, seriously, the opening act shows this and it's freaky. Two kids smarten up and try to safely evade their parents until the madness dies down. Nicolas Cage and Selma Blair star as the parents, and Anne Winters and Zackary Arthur as their kids. I saw this movie at the Sitges Film Festival and it's fun, in a very wicked way, but it's not that great. It's a quick, throwaway late night movie when there's nothing better to watch - and Cage's craziness fits perfectly. Enjoy. For 24 hours, parents all over the world wreak violent havoc on their children, and a teenage girl and her little brother must fight for their survival while escaping the unrestrained wrath of their own mother and father. 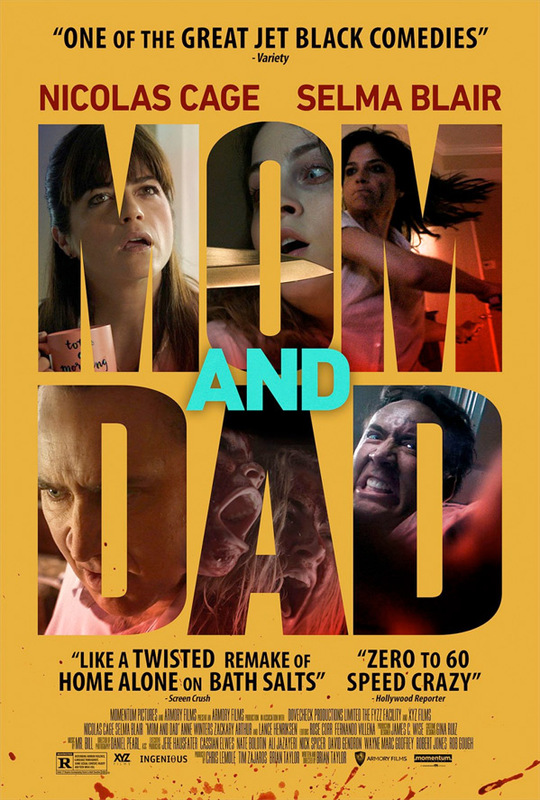 Mom and Dad is both written and directed by filmmaker Brian Taylor, who is making his feature debut as a solo director, after co-directing with Mark Neveldine for years as "Neveldine/Taylor" - together they directed Crank, Crank: High Voltage, Gamer, and Ghost Rider: Spirit of Vengeance. This premiered at the Toronto Film Festival this year, and also played at the Sitges Film Festival & Fantastic Fest. Momentum will release Mom and Dad in select theaters + on VOD starting January 19th, 2018. How does that look?